The real-life "Dumbo" is a baby elephant who is forced to perform in unnatural and distressing shows at Phuket Zoo in Thailand. The tiny infant is made to "perform" for tourists up to three-times-a-day in shows that include "raving" to loud music, "playing" musical instruments, and performing tricks. Eyewitness footage and images have also revealed his skeletal body, raising concerns of possible malnourishment and exhaustion. When he is not performing, he stands on display for tourists, all while silently sucking on his trunk for comfort - a sign of distress seen when infant elephants are without their mother. We must stop this from being his fate for the rest of her life. More footage from the same zoo shows adult elephants swaying in distress, and a sharp bullhook being scraped against an elephants' tender skin. No elephant should have to live in such heartbreaking conditions. And "Dumbo" deserves to spend the rest of his life in a place where he can feel happiness and peace. 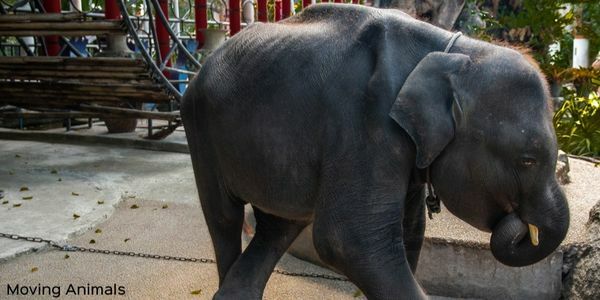 Please sign and share the petition calling for Phuket Zoo to release this baby elephant to an ethical sanctuary immediately. Together, we can give him the life he deserves. Thank you. For more images, information and updates about "Dumbo's" plight, visit Moving Animals.